Imagine a future in which humans can produce a vast variety of foods with all sorts of textures and shapes at the flick of a switch. Just throw a mix into your 3D printer, and, presto, gooey gorgonzola globules! Crunchy candy cubes! Incredible! That future is not quiiiite here yet. But it could be close. Scientists at the University College, Cork in Ireland wondered how the 3D printing process might change the properties of an American classic, processed cheese. The end product was substantially different from the cheese they put in, but this was likely the first time anyone had tried something like this. 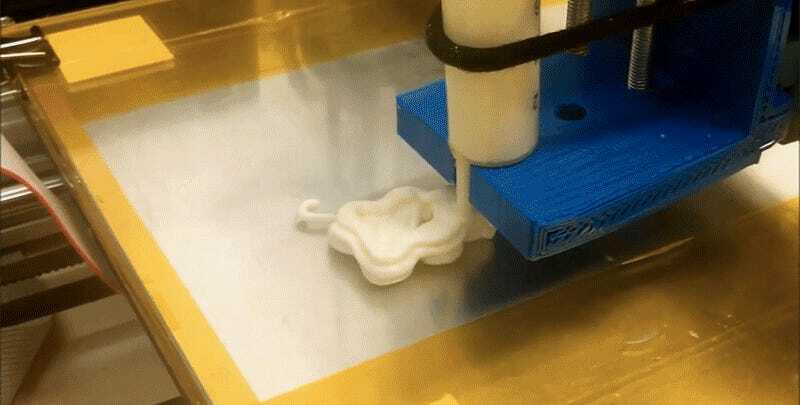 There are several ways 3D printers print things, including mixing some fine powder and a binding agent, or by squirting a melted raw product like Easy Cheese out of a nozzle to build up the structure. You can imagine which method they used with processed cheese. The researchers started with a RepRap Pro Ormerod 1 printer, retrofitting it with a custom syringe to handle cheese instead of plastic. They first analyzed melted and unmelted processed cheeses to compare their 3D printed final products to later. Then, they put cheese into their custom nozzle, and warmed it to 75 degrees celsius (167 degrees Fahrenheit) for twelve minutes. After modeling their end product in design and drafting software, they extruded the cheese at slow (four milliliters per minute) and fast (12 milliliters per minute) rates. They tried printing cylinders, which ended up looking more like a sloppy circular mess. The mascarpone bear was cute, though. A textural analysis showed the final 3D printed products ended up gooier and less thick than what they started with, no matter how fast they printed the cheese. 3D printed cheeses were also darker in color. Those textural changes likely came from changes to the cheese’s molecular structure during extruding—something we’ll have to think more about if we’re hoping to 3D print more foods in the future. Processed cheese comes from mixing a blend of cheeses with butter or whey, vegetable oil, proteins, salts, and water, explains the paper’s authors. Their original product started with a protein network that keeps the whole thing solid, with spherical dots of fats on the order of ten micrometers interspersed. While melting cheese creates larger spherical fat globs after the heating process, the extruding process changed the cheese’s molecular structure fundamentally. 3D printed cheeses had breaks in their protein networks and large, misshapen, non-spherical fat balls. These differences in structure could have led to the cheeses’ softer textures. So, no, you probably won’t see 3D printed cheese on your plate tomorrow, since scientists are only now figuring out how printing could alter the structural and functional properties of your food. But hey, if you’ve got a 3D printer, some cheese, and a custom nozzle, we’d love to see what sloppy creations you can come up with.